Have you ever questioned your ability to be an effective parent? We all have! 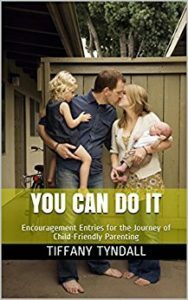 You Can Do It: Encouragement Entries for the Journey of Child-Friendly Parenting is a collection of writings that help focus the mind and heart as we endeavor to be good and loving parents to our children. Written when the author’s three children were ages six, four, and two, these words shine a gentle light on the footpath towards child-friendly parenting (specifically) and effective living (in general). You Can Do It: Encouragement Entries for the Journey of Child-Friendly Parenting is the third book in the Child-Friendly Parenting Series. The first title is Child-Friendly Parenting: Growing a Well-Functioning Family in a Home Environment That’s Good for Kids (No Matter What Your Home or Family Looks Like), and the second title is Resiliency Is Key: Tidbits of Truth on the Journey of Child-Friendly Parenting. No matter what your struggles may be, we can find hope and help in our ability to adapt and adjust to our life’s challenges, as well as in our ability to choose for ourselves which way we will go. We don’t have to parent our children exactly the way we were parented—we can hang on to the good and improve upon the rest. As we learn to put into effect healthy and happy cycles of choice, freedom, and trust (all within the safe bounds of love and care), we will be growing for ourselves and our family a life of nourishment and flourishment. So as each entry speaks truth to you, may you be welcomed into a better life—a better present and a better future—one in which effectiveness is the aim and wholesomeness is the way.